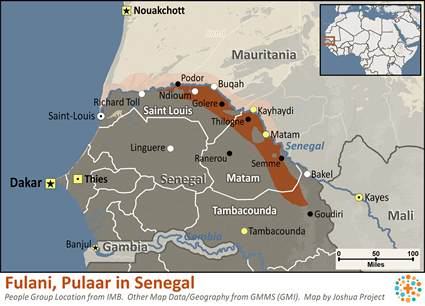 Over one million Pulaar (or Tukulor) live in the West African nations of Senegal, Gambia, Mauritania, Guinea, and Mali. 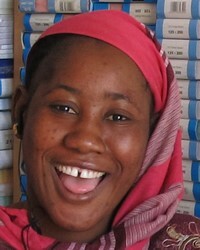 Most are located in Senegal, where they comprise nearly one-tenth of the population. They are mainly concentrated in the Middle Senegal River Valley near the Dagana River. The Pulaar are thought to have descended from the Fulani and the Wolof or Sereres tribes. Their name is derived from the Arabic word Takrur, which was a term used to describe an eleventh century realm near the middle Senegal River Valley. Today, the Tukulor are known by a number of names, including Pulaar and Torobe. They have retained their respective languages, and many are also fluent in Arabic. Most of the Pulaar live in rural areas, where they raise livestock, farm, and fish for their livelihood. A steadily rising population and an unequal distribution of land have resulted in large numbers of Pulaar (particularly youth) moving to the cities in search of better job opportunities. Traditional, rural Pulaar villages are small. They have round huts made of clay or rough bricks, with straw roofs. Villages are governed by a group of elders from the aristocratic caste. Dietary staples include rice, millet, sorghum, fish, nuts, and fruit. The current high levels of unemployment are forcing many men to travel to France or urban areas of Senegal in search of better paying jobs. Decreasing income from the sale of agricultural products, encroachment by the Sahara Desert on farmland, deforestation, and increasing population are resulting in extreme financial concerns for the Pulaar. In addition, the construction of dams on the Senegal River could result in displacement of many families and villages along the Senegal River. Nearly all village water sources are polluted. Malaria and other infectious diseases inflict a heavy toll each year. Although there is some literacy among the aristocracy, most of the Pulaar are illiterate. Christian teachers, humanitarian aid workers, and medical teams are needed to live among the Pulaar and share the love of Jesus with them in practical ways. * Ask the Lord to grant wisdom and favor to missions agencies focusing on the Pulaar. * Ask the Lord to call Christian teachers, doctors, and humanitarian aid workers to Senegal to share Christ with the Pulaar. * Ask God to raise up prayer teams who will break up the spiritual soil of Senegal through worship and intercession. * Pray that strong local churches will be raised up among the Pulaar.View Fulani, Pulaar in all countries.